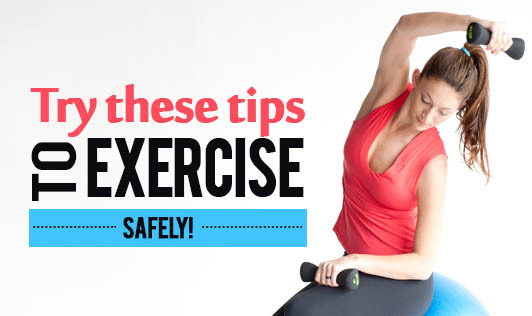 Try these tips to Exercise safely! Indulge in some exercise with the easy to follow tips which allows you to be active safely. Have pain or pressure in the left-chest or mid-chest area -- or left neck, shoulder, or arm. Drink lots of water before, during, and after exercise to replace the water you lose by sweating. Injuries: Taking things slowly is the best way to avoid injuries. Be sure to warm up and cool down with proper breathing and stretching techniques. Be aware of the dangers of overtraining, and always give your body enough time to recover in between. Exercising with someone else can also reduce the risk of being injured. Eating Meals: Eating a healthy diet along with exercising is very important. You should eat enough before you exercise to fuel your body and wait anywhere from sixty to ninety minutes after a meal before you begin. Weather Conditions: Do not exercise in extreme conditions; it only increases your risk of being injured or worse. Give your body time to adjust to the weather for a few weeks and alter your intensity based on the weather conditions. See your doctor for a full medical check-up before embarking on any new fitness program.